The setting: a dimly lit room, with a wingback chair upholstered in black and white striped fabric, next to it a small table holding a silver tea pot and a delicate china cup with a pattern of black lace and roses painted on it. The silence is broken by the sound of a door creaking open, and the Lady of the Manners walks into view, carrying a candelabra full of flickering candles. Even though she is wearing a floor-length, high-collared, and extravagantly ruffled white Victorian-style nightgown, her black eyeliner and burgundy lipstick are impeccable. Goodness, it has been ages since I’ve visited the Nocturnal House, hasn’t it? It was so quiet and peaceful in the crypt that I must have dozed off for … much longer than I had planned. 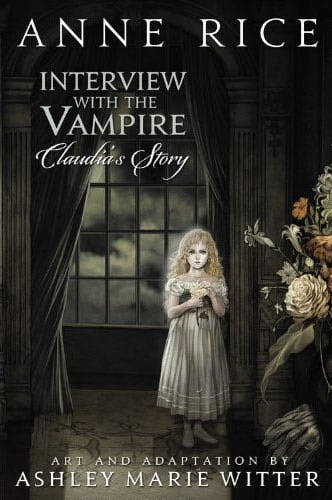 But no matter, I’ve returned to the library of vampire books just in time for Halloween to talk about one of my favorite books of the past year: Interview With The Vampire: Claudia’s Story, adapted and illustrated by Ashley Marie Witter. As some of you are no doubt aware, I harbor an enormous fondness for the first three books of The Vampire Chronicles by Anne Rice. They’ve become a touchstone for modern gothic literature, in both the classical and subcultural definitions of “gothic”, and many of the “romantic and angst-ridden vampire” cliches that riddle current vampire fiction first blossomed in the lush and overwrought prose of those books. In times of stress or chaos, they are among the books I turn to for comfort reading. My favorite character is, unsurprisingly, Lestat. (In his Brat Prince, handsome fiend incarnation, not who he eventually turned into after The Body Thief and Memnoch The Devil.) But my next favorite character from The Vampire Chronicles is Claudia, poor doomed Claudia, cursed with an immortal adult mind in the never-aging body of a child. I have no idea how Ashley Marie Witter was able to convince Anne Rice to let her do an adaptation of the story of Interview With The Vampire, but I’m delighted she did. For not only is this book from Claudia’s point of view, it’s a gorgeously illustrated graphic novel. I have longed for an illustrated version of the stories from The Vampire Chronicles. Yes, I know about the comics from the 90s – in fact, I used to own some of them. (Those issues may even still be lurking somewhere in a box.) But the art wasn’t quite to my taste, and every time I saw a piece of manga-style fan art for The Vampire Chronicles, I’d flutter my hands and sigh. 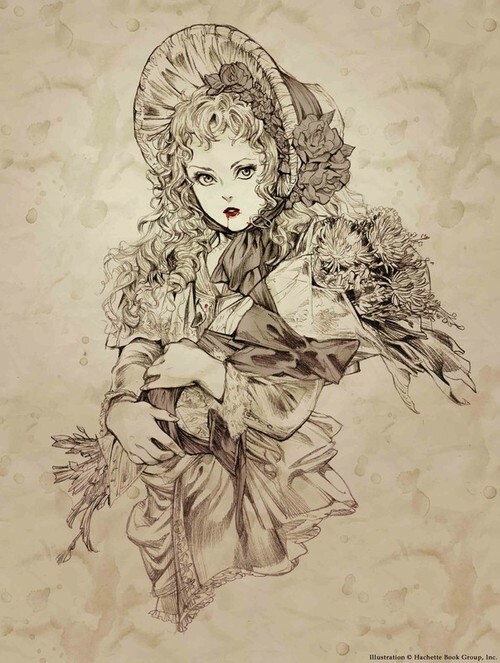 But Claudia’s Story is the sort of illustrated adaptation I’d always hoped for, with delicate, dreamlike art full of intricate details, in shades of black and sepia with some artful touches of blood red. The book opens with Lestat feeding the dying little girl some of his blood, turning her into an immortal companion for himself and the always-brooding Louis. As soon as Lestat’s blood changes the child, he begins training her as a predator, summoning a servant to slake her hunger. Hunting and seduction were Lestat’s lessons for me and I came to know and relish death’s many moods. Lestat was the perfect tutor, and I absorbed all that he was willing to offer. At the time, I gave no thought to what I had become. I was still a child, though clearly not. Lestat nurtured the killer inside me, but Louis was the father to the child. I’d asked Louis if he understood, but how could he? Even this beautiful man whom I loved was, of course, incapable of grasping the pervading sense of confinement I experienced within my own frame. Had I not already been consigned to a child’s coffin? The coffin turned out to be merely the beginning of my new-found fascinations. Squalor and decay suddenly offered an allure heretofore unknown, and I begged Lestat to take me to the riverfront where the immigrants lived. Claudia’s discontentment with a perpetual childhood that is a brittle shell for her force of will sets her at odds with Lestat, who wants nothing more than adoring fledglings to play Happy Vampire Family with him. Claudia takes matters into her own hands to free herself and Louis, but still seeks the answers she couldn’t get from Lestat. Despite Louis’s doldrums, my spirits were jubilant at the prospect of finding others of our ilk! When Louis and I gazed across the waters for the first time at the coastlands of Europe, it was with reverent awe at a dream nearly realized. It was only later, as we began exploring the villages, that I would be forced to grapple with the disappointment of so much promise unfulfilled. It is only once they go to Paris that they find other vampires like them, vampires who flaunt their monstrousness behind the guise of morally ambiguous theatre performances. The Theatre des Vampires, led by the mysterious and charismatic Armand (another character I’m terribly fond of) draws Claudia and Louis into their orbit. How did I fail to see that the mind responsible for this doughty wickedness might be capable of similarly stripping me bare? Of orchestrating my own undoing with equal showmanship? For Armand wants Louis to be his immortal companion, to be the only creature Louis feels a connection to. And Armand is all too willing to play a game that includes the maker that Claudia thought she had lethally dispatched. Accused by the other vampires of attempting to destroy the vampire who created her, condemned by the words of a resurrected Lesat who is a weak shadow of what he was, Claudia and the fledgeling that Louis created to look after her are sentenced to death by burning in the sun. Was this a life cut short? A passing to be mourned? Had my dark fathers not given me an existence far in excess of a mortal allotment? Ultimately, though, that existence was untenable, the rancor within me overspilling that dainty vessel. I would suffer no longer. Oh thank you for sharing this! Claudia has always been a favorite of mine, not in the least because we share a name. And no matter what anyone says about Anne, to me she will always be the gracious and lovely woman I met at a signing, who, when my 19 year old baby-bat self burst into tears over meeting her, stepped out from behind the table, took my hand and sat me down next to her until I had recovered my self. A link on where to purchase would be helpful though. I, too, have fond memories of reading and re-reading the first three novels of the Vampire Chronicles. I also find Louis to be overly whiny. And I bought this book on recommendation, after first falling in love with the artwork. It is a true delight. Curl up with a cat, some crumpets and a pot of tea and enjoy. I love these books to death! They’re beautiful works of Gothic literature, and (in the opinion of this English major) exceed Bram Stoker in their literary value, style and as far as the vampire novel goes, second to him in nothing save for cultural impact (Stoker won this merely by shocking some Victorian sensibilities, but my novel-length lecture on why the Victorians with all their morals and hypocrisy were so fearful of the Count is for another place). Anne Rice has taken the Byronic anti-hero and crafted an ingenious new mythos for a ‘modern’ race vampires–the series captures so much more of the opulent and indulgent side of the Gothic than traditional sources do, more of the velvets, more of the ironwork, both beautiful and dark, intricate yet strong; we have all the extravagance of the Red Death’s masque scene, but all the terror (that is the sublime terror, not the fear) of the “monsters.” Even more, she takes the Gothic literary trope of the “other” who is usually the feared object or (if a character) the antagonist and makes him our narrator, the one whose mind we get to delve into the deepest; she has no “villain” in her works, merely clashes of the personal philosophies (and in some cases, theologies) of the others we meet within the pages. I first encountered The Vampire Chronicles through the movie, when I was thirteen. I watched it over and over again. A few years later I read the books, which are now some of my favourites. Out of all of the characters Lestat is my favourite. Even though Marius isn’t as interesting a character as Lestat he’s also a favourite thanks to his interesting story. I just have read the first two books, but I’d love to keep reading the series, and also Claudia’s Story. She is one of my favourite characters, second to The Brat Prince :D. Funny thing, I think I’m of the few people among the Goths of my country (Chile) who have read a book first, and saw the Interview film later. I loved it in a crazy way; it might’ve been the unexpected ending, hahahaha. I didn’t like the Queen of the Damned film at all, though. I want to know if I can come hang out in your library! I’ll wear my 19-teen-ish white cotton robe to coordinate with your gown. A couple of years ago, I read the original “Dracula” on your recommendation and loved it. I grew up with “Dark Shadows” but had never actually read the source book until then. Oh, and I’ll bring tea. I have a friend who brings me loose tea from China when she goes home. I totally did not know that there was a story for Claudia. I love the vampire chronicles. thanks for sharing! I’ve been in love with the Vampire Chronicles since I was ten years old… My parents took my sister to see Interview that year; she was only five at the time. (She laughed when Louis bit into the rat.) My mother let me read her Anne Rice and Stephen King novels after constantly catching me in the bathroom at night, having stuffed a towel under the door, absorbed in the macabre. I think this is a lovely way to pay homage to a character that, in my opinion, perished too soon. I find Rice as a writer of taste and style, unlike such sleazy, overrated names as Stephen King, Poppy Z Brite, Nancy A Collins etc but I prefer more Hammer Horror style of Gothic. I love the first three books but, like you, am not particularly fond of the others. Armand is one of my favorite characters, too. I’ve also read some of the original Vampire Chronicles comics but didn’t care much for the style. I’m inclined to agree with Ms. Angelika about Stephen King being overrated: his writing bores me to sleep! I’m quite surprised that Ms. Rice allowed this adaptation. I had read that the character Claudia was patterned after Ms. Rice’s own daughter who had died. I dislike graphic novels in general, however I would love to read this if it were in book form without the pictures.